Nonetheless EPA's emission violation came to light when emission tests were carried out in real time conditions. If ARAI were to test Volkswagen's CRI Diesel engine models under emission testing facility, it may repeat the EPA goof up. Dumb question why did they have to turn off the emission controls in real world would it be a loss of power if these emission controls are turned on ? suryag wrote: Dumb question why did they have to turn off the emission controls in real world would it be a loss of power if these emission controls are turned on ? The way someone explained it to me is like this. Performance (as in, quick pick up and acceleration), fuel efficiency and emissions are the three parameters that define an automobile. You can control any two but not all three. VW chose to control, for obvious reasons, performance and fuel efficiency and bid goodbye to emissions. Of course when vehicles were tested on treadmills, the company sacrificed engine performance. But they reckoned without some Asst Prof of West Virginia University, designing a test kit that would attach itself to the tailpipe of a car and analyse the emission. The rest is history. did bajaj came out with their new cruiser pulsar cs 400 yet? 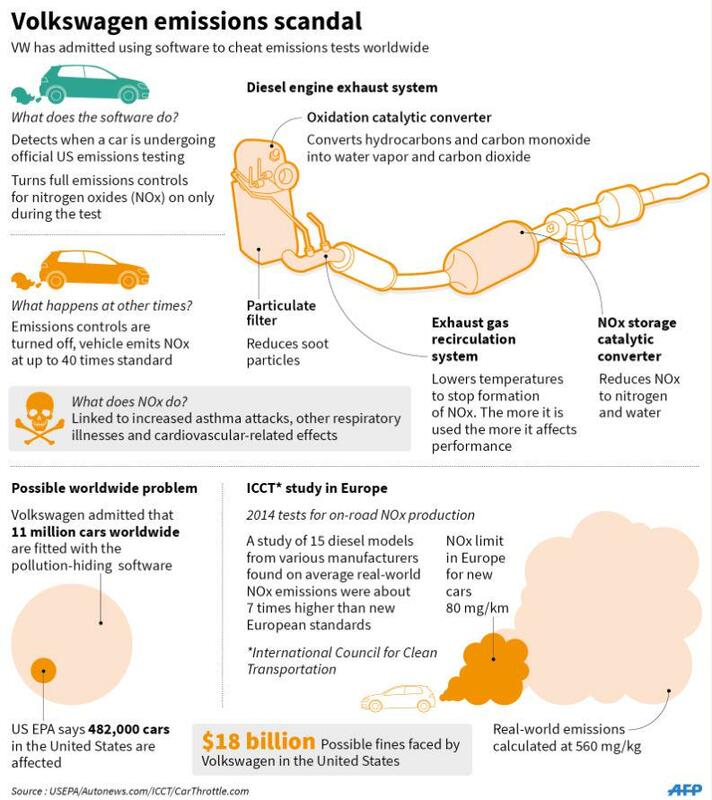 VW's cheat device was designed to game US emission controls , remember entire EU runs Mercs, BMWs, VWs and Audis with diesel power plants but in the Massa only VW group managed to clear the emissions norms (we now know how). Point being ARAI even if tests the VW engines without the cheat device will not be able to find anything wrong for BSIII emission norms in India are even more liberal than the current Euro norms on emission . All this if ARAI actually does conduct tests in a fair manner otherwise money can always buy such agencies in India. there are known cheats, and there are unknown cheats. but if the cheating itself is hidden behind a system, we take it back to 'unknown unknown' world. everything is corrupted and polluted! SaiK wrote: did bajaj came out with their new cruiser pulsar cs 400 yet? nope, they have just released the RS200 and is expected to release re-engined avengers soon. mahindra however has just released the 295 CC Mojo. - to name a few.. i have not done spec by spec comparison. Update regarding the Ford Aspire and Figo, the 1.2 Petrols ,Base and Ambient Diesels do not have Front Stabilizer bar or anti roll bar. Dont know how crucial this. The new Baleno is out and all the Automotive Media is all gaga about it on how new international model is from India will be exported to all over the world and Japan (a first MS history). The car has modest engines but superb power, fuel efficiency. However, the cars are extremely lightweight Petrol 865-890 KG, Diesel 910-930KG. But is wider than other hatches. Fanboys are claiming this due some new chassis technique Suzuki, others are saying it is a modified vehicle on Esteem Chassis. Only once these cars are released in Europe/Japan and their kerb weight published this debate will be sorted out. Over the past few years I am getting worried over some practices in the Indian Market. While the European Versions of Maruti Swift, Hyundai I10 do well in Euro NCAP, the lighter Indian versions seem to abysmally scoring 0 stars. Maruti Petrol variants for Swift, Ciaz etc are lighter by more than 100kg, but the engines, battery, certain other parts this gap should be only about 30KG. to me it seems since 2010 Maruti have adopted a strategy of making their Petrol cars ultra light to make up for the lack of low end torque from the small NA engines they are sold with. They probably reason those buying Petrol will average too many miles and will most probably restricted to city use and not on high speeds on highways, they are also probably less abuse Friendly. The exception being Baleno Diesel which will be sold only from NEXA showrooms in Urban areas, here the Petrol Diesel Weight gap is not much. The big question is are Indian customers looking only for VFM pricing and FE? Is safety not a problem for them? Last edited by Aditya_V on 30 Oct 2015 12:51, edited 1 time in total. Singha-> thats true, in Chennai - BLR highway you might have noticed some people ignore concepts like Braking distance and just rip it. saar even maruti altos were leaving me in the dust with 120 speed....sedans were above 120...bideshi cars at 150(prestige issue). as you age, you definitely don't want to drive non-stop without food for 7 hours. a second blip is enough to get dead-tone sound on your phone. my goal in life is to avoid driving the 100km krishnagiri to blr stretch in the dark, esp in the dark+rain. but unfortunately even after my efforts had to drive 2 hrs from 6pm in the dark. Did BLR-GOA and GOA-HAMPI-BLR over the Dusshera holidays. Did BLR-GOA in 11 hrs, with a 1hr lunch break at a resort at the start of the road leading to DoodhSagar falls thrown in. Left BLR at 4:30 in the morning and covered the distance to Hubli in pretty good time. Crossed the ghats with a miserable 60 odd km stretch on the KA side and got into goa in good time. Not bad if you motivate yourself to leave early morning and bet the traffic. Never drove in North KA before, but realised that the entire area east of Hubli is basically a vast arid (some parts resembled near desert like conditions) emptiness, until you hit the Tungabhadra river that separates Koppal and Bellary districts where you get greenery again. North of Hampi I guess again is the arid part between Hubli and Hospet /Hampi. KA sure has vast room to industrialise and grow and take the pressure way from BLR . But with the politico monkeys we have will never happen. Hospet and surrounding areas sure had a lot of mineral based industries. Hospet roads are just as ruined as the Hampi ruins. Hospet /Chitradurga road again pot hole ridden in most parts ,with heavy interstate truck traffic and basically below par. It gets good only after you hit NH4 at Chitradurga. All in all felt sad at how KA wastes it's potential and how even something like Hampi is so terribly managed and maintained. Hospet bellary hiriyur road was better than chitradurga when I went. Almost no trucks and hiriyur bellary very smooth then bellary to hospet very bad. Place near bellary was ruined and polluted by crude iron smokestack industries. Jindal town had a nukular type dust cloud over it. Blr to Goa is probably one of the most boring and mind numbing drives , I drove all by myself twice with my dog as company and once with wifey last year and hitting the ghat section in the evening is not a good thing , I had to fold my rear seats and keep my dog on a leash for most of the time. True. Maybe next time. It was quite hectic as it is. We took a day trip from Goa to Karwar and Gokarna and back. Next time the trip should be via Mangalore -Udipi-Mudreshwar-Honnavar-Gokarna. I have not been to Gokarna before, but after going there in terms of just experience, it trumps Goa by orders of magnitude with it's beaches and small town. A definite place to visit again. As for Karwar, the last time I went by road between Mangalore and Karwar was some 25 to 30 years ago and I always remembered the stunning scenery in places like Honnavar and especially from road on the cliff sides at Karwar from where there was a stunning view of the bay at the foot of the mountains . Now with the Naval base built and they rising a huge wall all over the cliff adjacent to the road, the stunning views and vistas are lost. A terrible pity. I wish they had just put in an electric fence instead of a wall. Ka is a giant state. And pretty diverse too. The Bangalore-Mysore belt is quite different from the belt running roughly from Bangalore all the way up to the old Hyd-KTK regions where the population and culture is a very mixed one of Kannada and Telugu and the coastal belt , which again is distinct, with the regions to the leeward side of the western ghats largely clustering with the Mysore kind of regions. Exactly why having Bangalore as the Capital, at the southern most tip, surrounded largely by TN and Andhra on 3 sides and far away from the Northern and coastal regions is probably a Meh. Ideally, KA should build a new capital somewhere around present Harihara or thereabouts and kick out all the Politicos and Baboons and other associated hanger-ons there. I for one would be more than willing to pay an extra cess to fund that and rid Bangalore of those pests. Hopefully, the rest of KA will see some development and infra and Bangalore can develop without these parasites. The Polticos and their weird backstabbing and idiotic games and theivery are best quarantined away in a place where they have least effect . BLR-Mysore and coastal belt can go on unhindered. one new warlord was demanding the home portfolio. CM snookered him by giving him the portfolio but keeping the bangalore with incumbent george sahib and CM retains intel. i have visited the honnavar - udupi stretch a couple years back after reaching honnavar via a night halt at shivamoga...very nice lush green territory and the final crossing of the ghats is dense forest. there is a place called maravanthe with a good beach and road runs between the sea and a river(suparnika iirc) on the other. road was under construction and one stretch near baindoor-shiroor-bhatkal was terrible then. bhatkal is a interesting place. mixed population , arabi islam is seen in strict form there with women in full face burqas, male chaperons etc. its has earned a good amt of wealth via gulf remittances. murudeshwar is good, the beach is a bit crowded with day trippers though there is a pristine beach just to the south visible from the hill of the shiva statue. people, incl hotel owners and shopkeepers have time to talk, walk among nature and be human, unlike the constipated Itvity kamandus here. our hotel owner led us deep into the ghats for some waterfalls and showed us his farm fronting maravanthe beach where he plans to develop hotel later. he also showed us a hilly road to bypass the terrible stretch...in my civic it was terrible with scrapes and bruises every 10 meters. my brat spent most of his waking hours catching small fish in a river that flowed just outside our hut in the resort. A one-time charge of Rs 2,493 crore related to the destruction of 5,800 Jaguar and Land Rover (JLR) vehicles in a blast at the Chinese port of Tianjin has dragged Tata Motors into the red. The company posted an unexpected consolidated net loss of Rs 430 crore in the second quarter of fiscal 2016 compared to the Rs 3,290 crore profit a year earlier. ^^ don't tell me that those brand new cars are uninsured for fire and blast damage in transit!! ashish raval wrote: ^^ don't tell me that those brand new cars are uninsured for fire and blast damage in transit!! The company said they are writing off the inventory even though the insurance claim is being processed. Having said that it is rare for a company to be making loss provision before the claim is actually repudiated. But then this is China. You never know. You will assume the worst while hoping for the best. Actually in Accounting, you make the loss provision and if the claim gets approved taqke it as Income. Since Insurance will take a year, it is prudent to account this way. Here is an interesting thought. The insurance company that covered the transit insurance (ocean going voyage) will say that the cover ended once the consignment reached the port of destination. The company which underwrites the inventory (fire policy in insurance parlance) will say that they are liable only after the goods reach the designated warehouse which in this case the jv company running the JLR operation in China. I think this was at the root of the loss provision. Terms and conditions are very well regulated and there is an exact description. The gods change insurance when the gods are lifted by the carane. In such large claims the insurance companies drag out as much as they can and also try to look at loopholes. For example were the cars sufficiently secured? are there other liable people etc etc. As for the provision it makes great sense. The company gets to pocket the tax ammount for another year or so. The share market undertands this and there is usually little effect on the share price. This is standard practice. The banks/risk management team will make sure that the goods are always under insured facilities, they look at every aspect including workers comp. Infact we are currently pursuing a proposal a large manufacturing MNC that wants to conduct a risk assessment on their global SC as a art of the risks identification and remediation program. S&P said, it is currently unclear the types of policies that will be affected – property insurance policies or marine cargo policies. This will depend on whether the destroyed assets were in transit and covered by marine insurance, said S&P, noting that a standard marine cargo policy often covers onshore storage of up to 30 days. Or rename it to mean "minus cars"
Check out reviews of 2016 civic launched in Massa , I believe Honda is a bit slow to read Indian market they could have cleaned up entire VW and Skoda market here by bringing that car here . All those Jettas, Lauras and Superbs can cede space to the new civic . Honda unfortunately is trying to slug it out in the highly competitive low margin hatch and compact segment . Honda should realize that their badge still commands some respect and they should be playing in 12-25 lakh segment more aggressively . The government has decided to advance the deadline for implementation of higher vehicle emission norms by three years to address the deteriorating air quality. India, which currently follows Bharat Stage (BS) IV norms in many cities, will move to BS V norms from April 2019, against an earlier timeline of April 2022. Similarly, the BS VI norm will now come into effect from April 2021, as against April 2024. The ministry of road transport and highways has issued a draft notification in the same regard. BS IV will be extended to the entire country by April 2017. The draft norms for two- and three-wheeler categories will be notified shortly with advanced timelines similar to the four-wheeler category. “The minister of road transport and highways [Nitin Gadkari] is keen that the road transport sector should take a lead role in reducing the harmful effects of emissions on environment and climate change”, said a government statement. The move from BS III to IV is supposed to bring down the particulate matter from cars to half (0.0250 gm/km) and to one-fifth in commercial vehicles (0.02 gm/km). A shift to BS V will mean further reduction from 0.0250 gm/km to 0.0045 gm/km in case of cars. But no gain is expected in case of commercial vehicles. The shift to BS VI will reduce particulate matter from commercial vehicles to half (0.01 gm/km) but keep the emission from cars unchanged. Especially Diesel Passenger Vehicles need some focus, everyone talking CO and Co2 in India ignoring NOX. No wonder CHina and USA restrict Diesel personal cars and Trucks, otherwise Turbo direct fuel injection diesels seem ideal with their high fuel efficiency and high torque output at low RPM's. Volkswagen Group India has recalled approximately 3,23,700 cars fitted with 1.2-litre, 1.5-litre, 1.6-litre, and 2.0-litre EA 189 diesel engines that were manufactured and sold between 2008 and November 2015. A communication program is being devised to reach out to the owners of cars with EA 189 engines through the group’s respective brands. While the official statement had no mention of any technical fix for the cars affected by the recall, it is learned that the solution developed at the company’s head office in Germany will be applied to cars in India as well. The company had in a media statement said the EA 189 1.6-litre engine will feature a ‘flow transformer’ that will be installed in front of the air flow sensor to stabilise air flow and enable a more precise measurement of the incoming fresh air flow. This will help the fuel to be metered more accurately. According to the company, the 2.0-litre diesel engine will only need a software upgrade, while the 1.6-litre EA 189 diesel engine will be subject to a hardware and software fix. Volkswagen had been studying the air intake system for the EA 189 engine and decided that the air flow transformer would be the most efficient solution to reduce the emission level and bring it at par with globally accepted limits. The installation of the flow transformer and the software alteration to the 1.6-litre engine is expected to take around an hour, while the 2.0-litre engine — that will receive only a software upgrade — will be serviced to make it compatible with emission norms in as little as 30 minutes. India also gets a 4-cylinder, 1.5-litre derivative of the 1.6-litre engine which expands the EA 189 engine range to four — 1.2-litre, 1.5-litre, 1.6-litre, and 2.0-litre displacement engines. While there is already a technical solution for 1.6-litre and 2.0-litre engines, a solution for the 3-cylinder 1.2-litre diesel engine is still being developed. In September 2015, the Environmental Protection Agency (EPA) of the United States found out that cars across the Volkswagen Group portfolio were being fitted with a ‘defeat device’ — a software that modified its performance when it sensed being run in ‘test condition’ by monitoring speed, engine operation, and even steering wheel position. Volkswagen admitted to the malpractice and said about 11 million cars worldwide were fitted with the ‘defeat device’. The EA 189 engine was found to emit nitrogen oxide up to 40 times above the norms. In a recent development, Volkswagen’s global CEO, Matthias Müller, announced a cap on planned investments in “property, plant and equipment, investment property and intangible assets, excluding capitalised development costs (capex)” to the tune of Euro 1 billion to approximately Euro 12 billion (against the previous estimate of Euro 13 billion), while committing to the development of alternate drive technologies by increasing the expenditure on technology by approximately Euro 100 million. Kejri and the climate brigade are ruling that in Delhi even and odd registration numbered vehicles will ply on roads on alternate days. While the climate puppets are claiming this is a great step, I wonder if that includes all the netas/MPs/MLAs/Govt Goons and their numerous X Y Z category security staff and other goons. What will happen now is a majority of the single car owning families will buy another car with the odd/even registration number. You will also see a lot of used cars from other parts of the country being sold in Delhi for those who desire a second/multiple cars. Good condition cars are available for under a lakh so you will see even more cars now being sold and registered in Delhi. Dumb move by dumb politicians and to think that Kejriwal is an IIT graduate!!!! The biggest scam is not that they are incompetent which they always are. But they exempt themselves from the effects of it based on some strange xcuses like "national security", "terrorism" blah blah. I say ban private transport for all netas and their so called goon squad convoy of 20 cars. Let Kejri, Modi , Sonia all travel by Delhi metro and autos and buses. 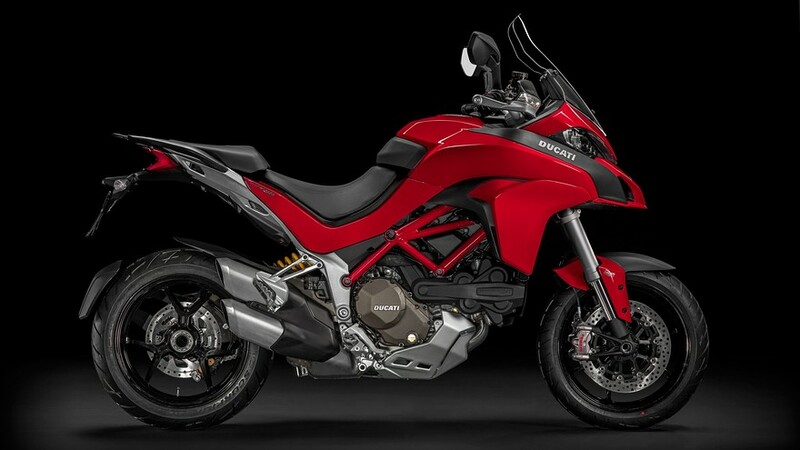 The Multistrada is now equipped with an inertial measurement unit, an IMU, which keeps tabs on the bike’s lean angle, as well as roll, pitch and yaw rate. The IMU-enabled stability system, supplied by Bosch, interacts with antilock braking and traction control/throttle management, all in an effort to keep either wheel from sliding out from under you while cornering. Indian Space Research Organisation scientists, in collaboration with the ministry and other wings, have developed the batteries costing Rs 5 lakh -- about a tenth of the astronomical Rs. 55 lakh for imported ones, he has said. He also lauded the role of ISRO scientists who have developed the indigenous lithium ion battery at a low cost of Rs 5-6 lakh in comparison to a huge Rs 50 lakh for the imported ones as the patent is being registered. Why is ISRO the one doing research on batteries? What are the auto companies doing? "An imported electric bus costs about Rs 1.75 crore whereas the one converted indigenously will cost about Rs 60 lakh, the price of which is likely to be reduced further on technology advancement," he said. What does it involve to convert a diesel bus to an all electric one? "The government wants to convert about 1.5 lakh state transport corporation buses into electric ones. We would like to convert buses operated by STUs in the next two years to electric mode. We are exploring innovative low-cost funding for this project," he said.